The latest liquidations began right after October 3. Oil shifted toward contango/crash, curves collapsed, even stock markets which looked like they had skated past disruptions early in the year were slammed. It was as if every market hit the same air pocket all at once, therefore identifying (global) liquidity as the major issue driven, of course, by reversing economic and risk assumptions. In other words, money dealers. Usually in these situations we can identify telltale signs of that sort of pullback, places like repo meaning collateral. As has been the case for much of this year, there isn’t any indication of distress at least in domestic repo. In that one sense, the FOMC has it all wrong as they’ve tried to blame T-bill issuance for some of the money market distress still building up; according to repo fails anyway, contrary to the pleading of Powell the bill “deluge” is more likely to have helped than harmed. This is also not unusual, in fact consistent with prior episodes of global monetary tightening (unrelated to the Federal Reserve). There has been a spike in fails which announces the beginning of the each one, and then it’s as if the domestic repo market goes quiet. The ripples of monetary disturbance go out from there and disrupt other pieces of the system. It has certainly been unusually calm in fails this year since March. 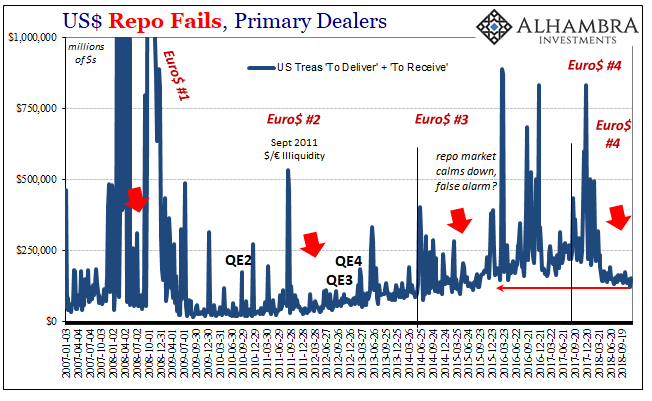 We have to be careful in that the data on repo fails provided by FRBNY is derived only from what dealers report, leaving a vast amount of the repo market undiscovered in good or bad condition. There is a lot that takes place outside what transactions may be captured by this one data series (fails). This shadow of a shadow market includes cross-border, offshore stuff. Getting a sense of function in those places is much more difficult since there just isn’t much data. There are some figures that exist, though not explicitly and directly tied to collateral used in repo. If we look at other data collected by the Federal Reserve, this time in a memorandum item attached to its balance sheet statistics, one possible proxy stands out. The Fed holds UST securities on behalf of foreign entities often other official institutions like overseas central banks. The balance in custody tends to rise and fall with each eurodollar disturbance. In the context of this shadow shadow repo funding mechanism extending offshore, the loss of UST’s from custody potentially signals collateral problems in that space. 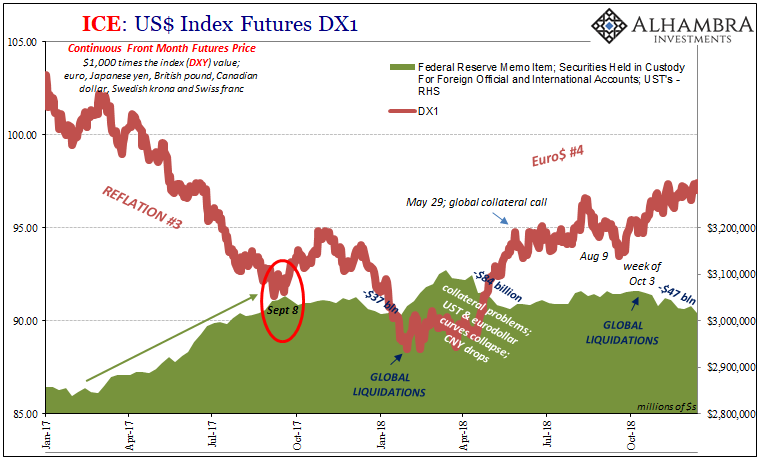 There was a big withdrawal suggesting collateral disruption and shortage centered around April and May leading up to the clear market dislocation (heavy buying UST’s, bunds, “strong worldwide demand for safe assets”) on May 29. There is another going on right now that unsurprisingly dates back to the week following October 3 when the latest “volatility” trend got started. Through last week, the total is about -$47 billion which puts it pretty high on the list of prior disturbances, though not nearly as much as six months ago. There are other collateral proxies that suggest this latest bout of collateral problems is much worse than before, consistent with the direction indicated in the custody holdings but expressing a far higher degree of disorder (bordering on chaos, really) – ironically pulled from the same data as the repo fails (huge thanks to offshore Emil for pointing this out). Since this is the week for piling on serious warnings, how about this one? 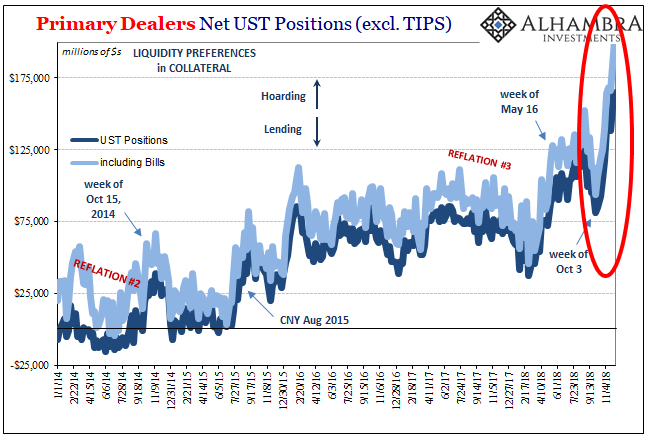 Including bills, the inventory reported to FRBNY for UST positions being financed by dealers is off the chart more than $200 billion for the first time (+$212 billion to be exact). Even without bills, it is still an alarming $165 billion net long in coupons. The more dealers hold, the less there is out in the system being passed around for repo, shadow repo, and shadow shadow repo. More compelling still, the timing of it lines up exactly with everything we’ve seen go wrong since the week of October 3. It’s yet another stunning indictment of Jay Powell’s competence, as well as this whole “strong economy” nonsense. 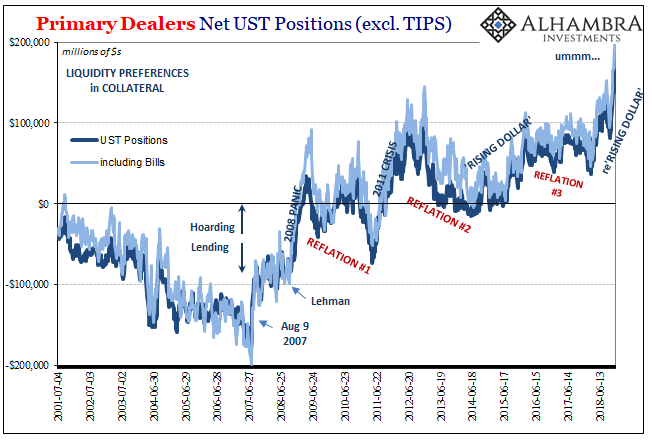 The very dealers the Fed relies upon to transact with as well as forward data and interpretations are hoarding collateral at a rate we’ve not seen since the worst days in 2011 or 2008. 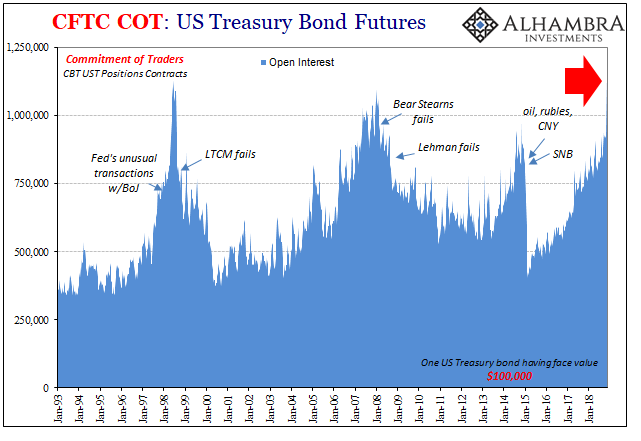 It certainly corroborates what’s been going on in the Treasury futures market (likely related to it) and the big warning which showed up there. What are dealers so scared of, the US economy being so good because the labor market is about to explode with massive wage gains? Hardly. It’s the same sad story playing out in a fourth chapter. This one, though, is starting to fill out with real emotion and not so much offshore, overseas. Since we are inferring here, if I had to guess this one’s more about collateral transformation using US junk as a basis in one of the legs rather than Eurobond junk which might’ve been the major problem seven months ago. Either way, dealers are stuck in the middle on the wrong side of a potentially serious reversal perhaps still in the early stages. As I wrote yesterday, buckle up. Dealers have been doing just that and for more than two months already.